St Vincent’s Pipe Organ – St Vincent's Chapel, Edinburgh, the village church in the heart of the city. The organ console today, replacing two earlier organs in this position in the north chancel. The organ of St. Vincent’s Chapel is a two-manual and pedal instrument located in the west gallery with a detached console in the north chancel. Despite opening as a new instrument in 1981, most of its components date from 1889. It was preceded by two other organs in the chapel. The first organ was built by David Hamilton of Edinburgh and opened on October 30th, 1859. 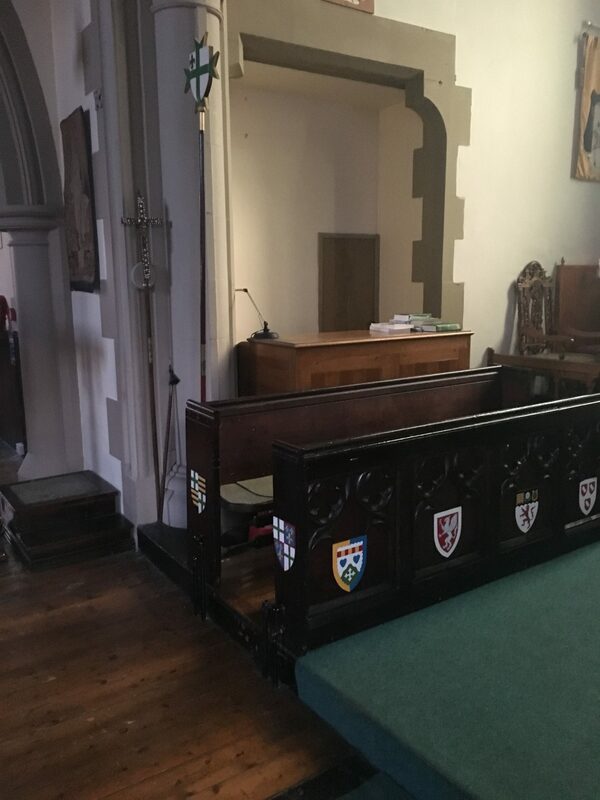 It was a small instrument, with seven stops over one manual, and is thought to have filled the arched recess left by the designers in the north chancel for this purpose. The second organ was built by William Townsend of Edinburgh and opened on October 6th, 1872. This one-manual chamber organ was a gift to the church from Dr. Skene, the owner of the building, and replaced the Hamilton organ. The original specification of the Townsend organ, and the fate of the Hamilton organ, is not known. In 1897, the Townsend organ was rebuilt to two manuals and pedal organ by Blackett & Howden of Newcastle at a cost of £160 under the direction by Mr. Thomas H. Collinson, the Musicae Baccalaureus of St. Mary’s Cathedral. The enlarged organ, with eleven speaking stops, was opened on April 18th, 1897. Reminiscent of the Hamilton organ, the Townsend organ was also sited in the north chancel recess and spoke only into the chancel. The console was attached and lay directly beneath a frontage of gilded great diapason pipes. Rushworth & Dreaper overhauled the organ in 1971, but it was removed ten years later when a new organ was installed by Ronald L. Smith in 1981. None of the Blackett & Howden organ could be used by Smith as it was found to be full of woodworm, and it was subsequently scrapped in 1982. The organ now in use in St. Vincent’s Chapel was originally built by T.C. Lewis of London for the residence of the Earl of Aberdeen, 27, Grosvenor Street, London, and was installed there in 1889 featuring sixteen stops over two manuals. From London, it was moved by Eustace Ingram of Edinburgh to the former Christ Church Trinity Episcopal Church, located at 118, Trinity Road, Edinburgh, in 1897. The Lewis organ replaced the 1882 Henry Bevington & Sons organ of Christ Church Trinity Episcopal Church, which was removed to Constantinople. After an overhaul by Henry Willis of London in 1961, Ronald L. Smith of Edinburgh rebuilt the organ to twenty stops in 1968 using parts salvaged from the organ of the former Leith Bonnington Church, which had closed earlier that year. A plaque on the console reads ‘reconstructed [in] 1968 [by] Ronald L. Smith, Edinburgh’, and refers to this rebuild. When Christ Church Trinity Episcopal Church was converted to housing in 1981, Smith dismantled the organ and stored it in his workshop until its installation in the west gallery of St. Vincent’s Chapel in 1981, for which the gallery was extended. The pipes were positioned on either side of the western window whilst the console, also from the former Christ Church Trinity Episcopal Church, was sited in the former organ recess in the north chancel. The inaugural concert for the Smith organ took place on December 17th, 1981. The position of the organ has overcome the previous lack of sound egressing from the chancel. The organ now floods the nave when advanced to its full resources, and yet will also reveal its subtle expressiveness on the quieter mutations. With the assistance of: Alan Buchan Curator, Scottish Historic Organs Trust, David Stewart Author, Organs in Edinburgh, The Very Rev. Allan Maclean Rector, St Vincent’s Chapel The Hon. Barnaby Miln Property Convenor, St Vincent’s Chapel.